Four Patch Quilt Finally Hanged! After my sister hanged her Double Four patch quilt in Paris, I thought it's time for me to hang as well one of my quilts instead of leaving them in a closet or as a sofa's throw. 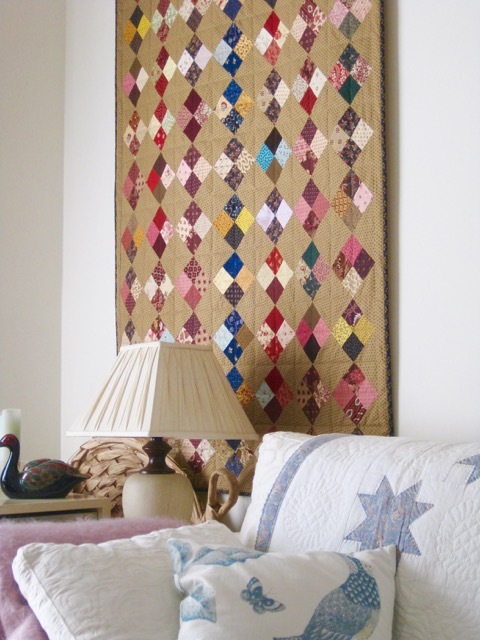 This Four Patch quilt was perfect for the size of a wall in my lounge. I sewed a hanging sleeve at the back, as shown in My tutorial and asked my husband to fix a rod on the wall. I am happy with the result and the good thing is that if ever I get tired of it I can change it easily. It gives a warm and cheerful touch to the room. Beautiful and what a warm glow it gives off at night. Quelle bonne idée tu as eu de l'accrocher dans ton salon ! Il est magnifique! Nice job on the quilt, love scrappie. 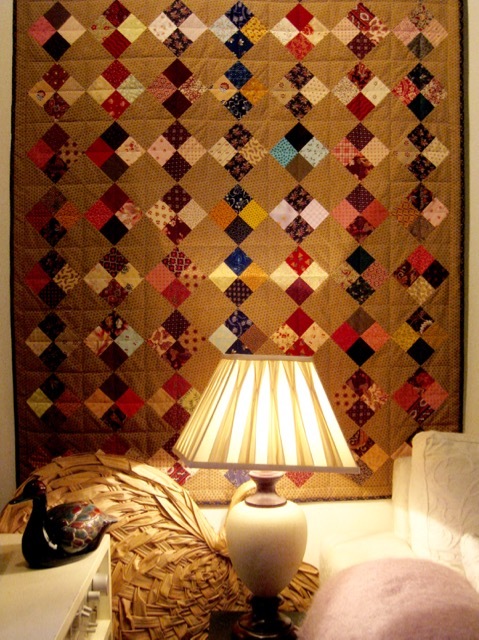 Looks wonderful hanging up there, quilt over the sofa and soft lights! 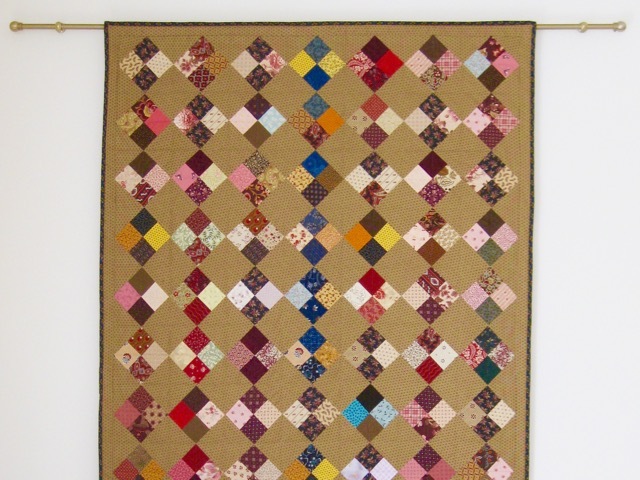 Love the scrappy quilts. Your quilt looks beautiful hanging--adds so much warmth and coziness! Très jolie ambiance j'aime beaucoup. 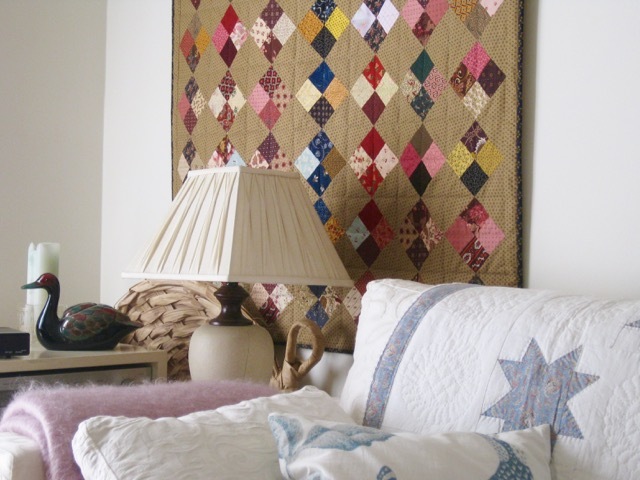 Your four patch quilt looks just as wonderful in your lounge as your sister's did in hers. Very warm and welcoming Christine! This must be a wonderful focal point for the room. So beautifully made! Your 4 patch looks wonderful! I love all your scrappy fabrics, lots to look at! wonderful four patch quilt! love that carmel background!! Very nice job, looks great on the wall. Beautiful quilt, and it looks great hung up on the wall! I agree completely, it looks lovely! That quilt looks great on your wall. I have one I would like to hang but I haven't any one to hang the rod for me.